This year’s UC Me campaign is now in market and features 26 new students who are all doing a variety of amazing things, from global travel, internships, to launching their own businesses and much more. The campaign is nationwide and will have a strong outdoor presence in Adshels (bus stops), billboards and bus backs. It will also be featured online as digital banners ads and in a variety of social media. The look has evolved from last year too, so keep an eye out. You might just recognise someone you know! To see all our students click here. The University Pharmacy in the Undercroft will be closed for Easter from Friday 30 March to Tuesday 3 of April. We will be open Monday to Friday, 8.30am to 5.30pm for the mid-semester break. If you are looking to get out of town to see this fantastic country this Easter you won’t be disappointed. With stunning scenery around every corner and more activities than you could ever have time for you will have a great time. To ensure you get to enjoy your time away to its fullest we have a few tips below. As always you are most welcome to come into the UniPharmacy and discuss any questions you may have regarding your medication and travel health. If you suffer from motion sickness from travelling on a boat, in a car or on a plane you might want to consider taking something to reduce the chance of it happening and ruining your trip. To prevent motion sickness there are a range of options from more natural ginger tablets, seabands (an acupressure band you wear on your wrist) to avomine/sealegs a drowsy antihistamine. To decide which is best for you consider what other medications you are on, how badly you get affected by motion sickness and the activity you are doing. You need to be particularly careful with the avomine and sealegs if you are driving as they can make some people sleepy. Although you are highly unlikely to come across anything venomous in New Zealand there is a high chance you will come across biting insects (if you are going to the west coast sand flies are a certainty). The bite of sand flies or mosquitoes can be extremely itchy, can cause swelling and become red and hot. To reduce the chance of infection it is best not to scratch (easier said than done) and to help with this you can take antihistamine tablets and apply antihistamine or anti itch creams. Prevention is better than treating bites so take steps to avoid being bitten. Long sleeve shirts and long trousers are ideal and insect repellent on any exposed skin is recommended. Insect repellents come in varying strengths and with a variety of ingredients, it is important not to apply them to your eye area. Although the summer is drawing to a close we always need to be mindful that the New Zealand sun can be very strong, it can cause sunburn in minutes. Wear sunglasses to protect your eyes, a hat to protect your head and face, and a long sleeve shirt will help to reduce your sun exposure. Regularly apply sunscreen to any exposed skin and don’t forget a sunscreen lip balm especially if you are on the water or suffer from coldsores. If you do get sunburnt apply an anti-burn gel or moisturiser, take paracetamol for the pain, drinking plenty of water and avoid further sun exposure. It is worth taking a small holiday first aid kit with you too. Easter: a time for reflection, and cynicism? As you’re probably aware UC staff and students are about to enjoy an extended break to celebrate a religious festival I like to call “Easter”. Now, for your average Kiwi it’s a time to gorge on novelty eggs over an extra long weekend. But for Christians, Easter is the most important religious festival in the annual calendar (It even trumps Christmas!) – and it’s the time when they remember the death (Good Friday) and resurrection (Easter Sunday) of a chap called Jesus Christ. The death bit is pretty much accepted by most historians as a historical fact, while the resurrection bit, understandably, is more hotly contested. One of my favourite Easter artworks, by Italian painter Caravaggio in 1601 is called “The Incredulity of Saint Thomas” aka “Tom the Cynic”. 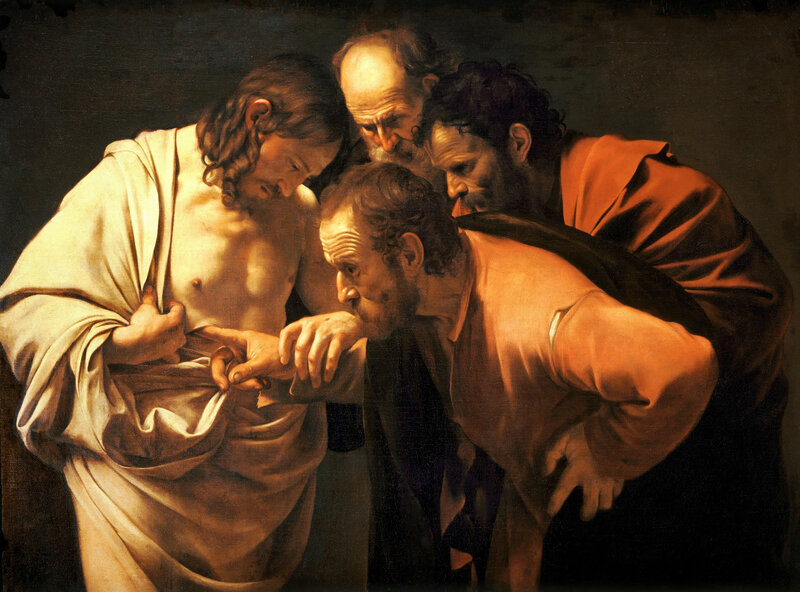 Thomas is the disciple who famously wanted proof that Jesus was actually back from the dead, and demanded to stick his finger into Jesus’ wounds. He was the original “Doubting Thomas”. Caravaggio, The Incredulity of Saint Thomas, 1601-1602, Sanssouci Picture Gallery, Potsdam Germany. I just love how gruesome the painting is. I imagine Thomas squishing his finger in Jesus’ wound – and I wonder if halfway through his finger test he feels that tinge of regret – like when we ask our friends to show us their mountain-biking wounds, and then wish we hadn’t. I also wonder if he washed his hands afterwards before eating dinner that night… And I guess this painting reminds me that when it comes to faith (be it religious, scientific, or economic) – no questions should be off limits, and no beliefs should escape the right to be prodded to see if they hold up to closer scrutiny. But be you a saint or a cynic when it comes to the Easter story – their may be something new about Easter you’ve missed all this time. Because for thousands of years Easter has also been the season when people have reflected on what character flaws or habits of they wish could be “put to death” (like, say, the way I become enraged when a car doesn’t indicate before turning), and what other aspects within themselves they hope might be “brought back to life” (like, say, the joy I used to get as a kid from painting or playing backyard cricket). So this Easter, be you a person of some faith or none, take this as my official Chaplain’s invitation to put aside time to consider what negative thing in your own life you’d like to die before you return for term 2, and what life-giving thing you’d like to create space for. UC will be a much better place for it, and so will you!